Mike, Great to have a comic -- but conspire means to act together. 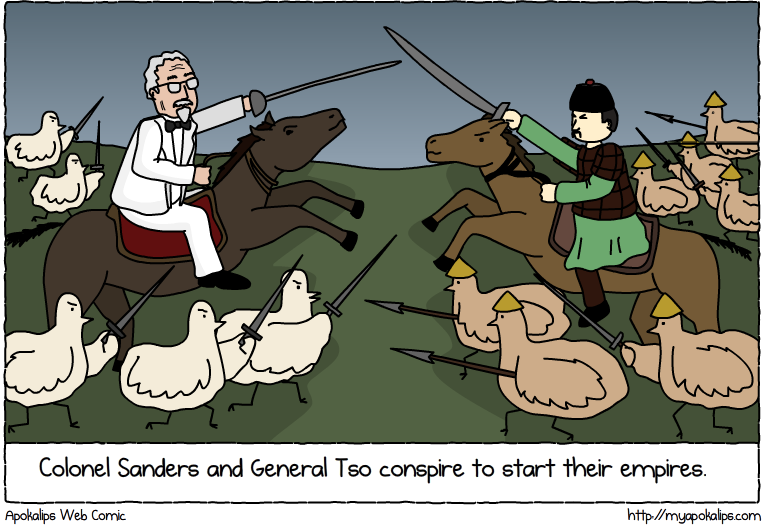 Sanders and General Tso look like they are going to battle each other. Thanks Tighe. Yea this one isn't so clear, but what they're doing is orchestrating a war between the chickens so they can harvest all of their chicken meat to start off their franchises/empires. Well, they're not kids, but they are short and exploitable. Lovely work as always mate. Two fast-food founding fathers charge headlong into a hazardous game of horseback chicken. How does one 'stumble into' a chicken coop? Was it disguised as a lame hipster bar? We all do, Tighe. I didn't draw it in but after the battle scene the ground maintained a 350 degree temperature for 25 minutes and it rained barbecue sauce. Once upon a time, I was at a math competition with a few friends, and we were ordering food. They dared me to ask who was General Tso. The lady on the other end just hung up on me. Oh right! Monthly poke! I still <3 The Grim Adventures and hope for an ending! love it. I bet the general breeds his army until it engulfs the colonel's chickens. O r the general's chickens get the flu... again. ....with every six dead you get free eggroll. And then, when they least expect it, the chickens unite and turn on their human oppressors! Bokbokbokhahaha!!! Semesterly poke! I still read through The Grim Adventures every few weeks, including the adorable scene from August 2009. And then the comics between November 2009 and March 2010 began disappearing! It was very frightening. Don't die, Apokalips! 109 this might be a good time for me to start PJ & BB back up :) I'm gonna run through them again this week. How often are these comics updated? :o Cause I'm dying to read another. I hope that by some Christmas miracle this comic will be revived! Hi Apokalips! I know you have Friday Morning now, but I still miss Apokalips. Always waiting for Grim Adventures, even if it's not happening anymore. Even if it makes me sound like a crazy ex. Thanks 109! I wrapped up the Friday Morning toon a few weeks ago. I think once the holiday is over I'm going to resurface one of these toons (apoka or grim). Thanks for keeping the faith! i do not find anything wrong with this, as a black man. Yearly poke! The datetime stamps could do to have a year on the end! I <3 Grim Adventures 4ever! I knew there were some comics that had disappeared, and now I can finally prove it! You had a 3-part Easter series that ended in the chickens going to the McPhersons and finding the eggs cooked. Where did parts 2 and 3 go? Bi-annual poke! I keep wondering what years the comments were from, so this one contains a timestamp. It is currently 1657 (Central time), March 17, 2015. I'd wait 500 years if that's what it takes!